Calgary has opened their regular season quick out of the gate. With two wins in their first two games against division rivals, the Flames couldn’t have asked for a better start. While they got away with murder on Saturday night against the Oilers with a 4-3 victory thanks to Nikolai Khabibulin’s bumbling wandering, the Flames still looked strong. The Flames special teams have been a key factor in their first two victories, with the powerplay cruising along at a 66.7% clip. The penalty kill has also gotten the job done and currently stands at 75%. Montreal has also started their regular season with two wins in two games, albeit in much more dramatic fashion than the Flames. Thus far, the Canadiens have squeaked out two overtime victories against their rival Toronto Maple Leafs, and the Buffalo Sabres. A huge blow that the team recently experienced was the loss of all-star defenseman Andrei Markov. Markov was injured in the Canadiens first game. He is expected to be out for 4-6 months with lacerated tendons. 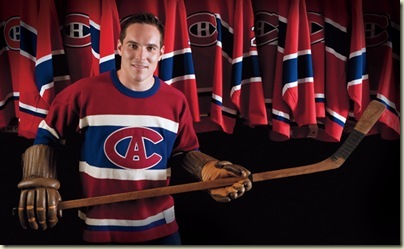 To fill Markov’s spot, the Canadiens recently recalled young Yannick Weber from Hamilton of the American Hockey League. Apart from this being the two teams’ first meeting of the year, this will be their 100th all-time meeting. Last season Montreal and Calgary split their season series, with each team getting one win apiece. Montreal was victorious in December 2008 with a 4-1 victory, while the Flames triumphed 6-2 in February 2009. Calgary- The man to watch right now is Miikka Kiprusoff. So far this season he has squashed his history of slow starts. Apart from two wins, Kiprusoff is also currently sporting a 0.921 save percentage. He has been peppered so far this season, already having faced 76 shots over those first two victories. If the Flames are to continue this early season success, Kiprusoff will have to continue his stellar play. On the offensive side of the things, the player to watch for Calgary is Rene Bourque. Last season, he managed to rack up 40 points on the strength of 21 goals, in only 58 games. Bourque has continued his strong play with the start of this season. Notching a goal and three points in his first two games, Bourque is the Flames current scoring leader. He has once again shown a strong two-way game, and has also been seeing ice-time during all different points in the game. Montreal- In similar fashion to Calgary, the Canadiens can attribute much of their early season success to the play of their netminder. After finishing last season with only 23 wins, and a 0.905 save percentage, Carey Price is proving his doubters wrong so far in 2009-10. 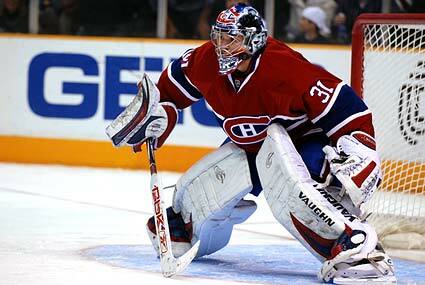 In two victories, Price is rocking an impressive 0.951 save percentage alongside a 1.89 goals against average. With 81 shots faced so far, Price has been a busy man, but has been up to the task. Mike Cammalleri will be the Canadiens skater to keep an eye on tonight. After putting up an impressive 39 goals with the Flames last season, Cammalleri headed out east and has been a strong presence on Montreal’s top unit. This will be his first game against his former team. Travis Moen will also be a player worth watching. Usually known for his grit over his scoring touch, Moen is currently leading the Canadiens with two goals in two games. While also employing his reckless physical game, Moen has been a force to be reckoned with so far this season. Expect to see him buzzing in the Flames end and causing nothing but havoc and chaos for the Flames defenders. Calgary- Cory Sarich (bruised foot) and Brian McGrattan (shoulder) are day-to-day. Montreal- Andrei Markov (lacerated tendons), Ryan O’Byrne (knee), Kyle Chipchura (shoulder), Olivier Fortier (shoulder), Alex Henry (fractured hand) are all on injured reserve. Glen Metropolit is questionable for tonite’s game (sore ribs). ~ by manovrboard on October 6, 2009.